Bubby Brister was born August 15, 1962, in Monroe, Louisiana and is a former American football quarterback in the NFL for the Pittsburgh Steelers, Philadelphia Eagles, New York Jets, Denver Broncos, and Minnesota Vikings. He played quarterback at Tulane and Northeast Louisiana University and was taken in the third round of the 1986 NFL Draft by the Pittsburgh Steelers. He was given the nickname Bubby (a mispronunciation of Brother) by one of his five older sisters. Being the sixth child born was his reason for choosing 6 as his jersey number. Pittsburgh sports writers and Steelers fans often made jokes about Brister's southern accent and perceived lack of sophistication, traits that were similarly mocked in Brister's predecessor, Terry Bradshaw. In a similar vein, his name was often misspoken. In a 1999 Sports Illustrated article, Brister cited Bubba Brewster and Bobby Blister as common manglings, and online his name often appears as Bubba Brister. One of Brister's famous quotes came after a 1991 game between the Houston Oilers and Pittsburgh Steelers. Pittsburgh was getting blown out, and coach Chuck Noll wanted to pull starter Neil O'Donnell and replace him with Brister to finish the hopeless game. Brister replied I don't mop up for anybody. Brister played for the Steelers for seven years, several of them as the regular starter at quarterback. 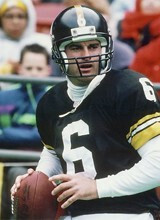 In 1992, new Steelers head coach Bill Cowher chose backup quarterback Neil O'Donnell over Brister, essentially ending his career as a starting player for the Steelers. After retiring from football, Brister spent a short time as a television sports analyst for Denver's Fox Sports Net affiliate. In 2003, Brister became the co-host of a hunting and fishing oriented show called Louisiana Outdoor Adventures on The Outdoor Channel. In 2005, he joined the staff of Hunters Specialties, a producer of hunting and fishing adventure videos. He now lives in Mandeville, Louisiana with his wife and two children. Football stars such as a Bubby Brister have taken the game to new heights by excelling at their respective position. The booking agents at AthletePromotions can assist with Bubby Brister speaking engagements or appearances from NFL stars. We have years of experience in booking gridiron greats for keynote speeches and autograph signings. Hiring a football speaker like Bubby Brister is not a hard process. Our agents can provide availability, fees and all costs associated in bringing out a successful football star to your next corporate event. We can find Bubby Bristers agent to make this booking happen. A Bubby Brister appearance will add energy to your upcoming event and reward employees, customers and clients.Most likely, football fans and corporations can find Bubby Brister's official website, charity involvement, Twitter account, representation, publicist and management info at www.Bubby Brister.com.